Welcome to Skinny Sundays! Let’s be honest with ourselves… the weekends usually get the best of us. One too many cocktails, some late night “snacks” after those cocktails, your “cheat day,” eating out at restaurants, not making time for exercise…. we’ve all been there (and hey, it’s fun!). Worry no more! On Skinny Sundays, I’ll be posting a healthy, low-calorie pasta dish to set you on the right path for the week. 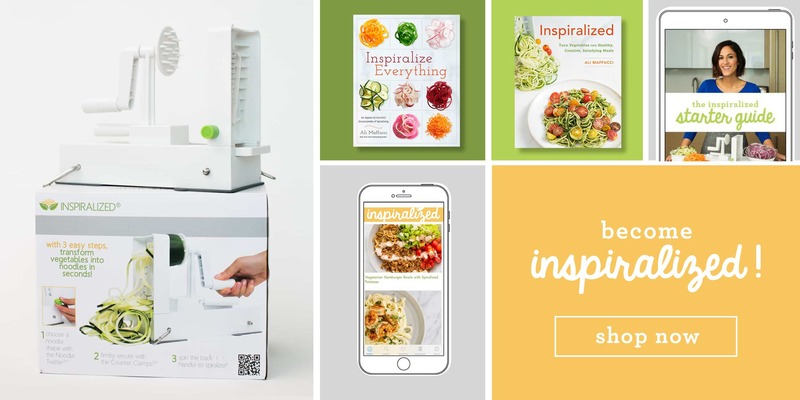 No more eating lettuce to detox… we’re Inspiralized, remember? That means a big ole’ bowl of guiltless pasta! 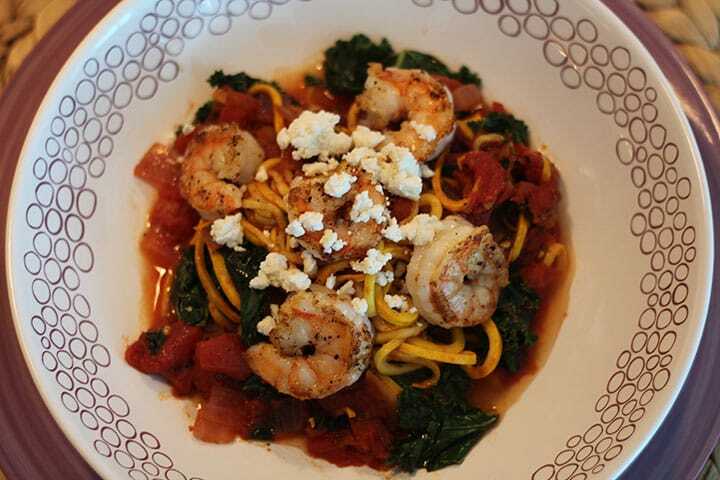 Tomato Zucchini Spaghetti with Shrimp, Kale and Feta Nutritional Information* Calories: 287.6 (367.6 with feta) Carbohydrates: 32.2 (33.2 with feta) Fat: 15 g (22 g with feta) Protein: 5.57 g (9.35 with feta) This is a rough calculation, made from CalorieCount.com. Skinny Sunday Tip: If you substitute olive oil cooking spray for olive oil, you will save yourself about 100 calories and about 11 grams of fat. Enjoy and congrats on starting your week out healthy and Inspiralized! Place a large skillet over medium heat and pour in olive oil. Season with salt and pepper. Once oil heats, add in garlic. Cook for 1 minute and then add in the red pepper flakes. Cook for 30 seconds and then add in the tomatoes, oregano and season with more salt and pepper. I like my tomatoes crushed, so I took a potato smasher and smashed the tomato chunks - you can do this with a fork! Let the mixture cook for about 10-15 minutes or longer, until the sauce reduces and most of the juices are gone. Then, add in the kale and zucchini pasta and cook until the kale is wilted and the zucchini softens. When you add in the kale and zucchini, put a medium skillet over medium heat and spray with cooking spray. Once skillet heats, add in shrimp and season with garlic powder, salt and pepper. Cook for 1-2 minutes and then flip on the other side for another 1-2 minutes or until shrimp is cooked through and opaque. 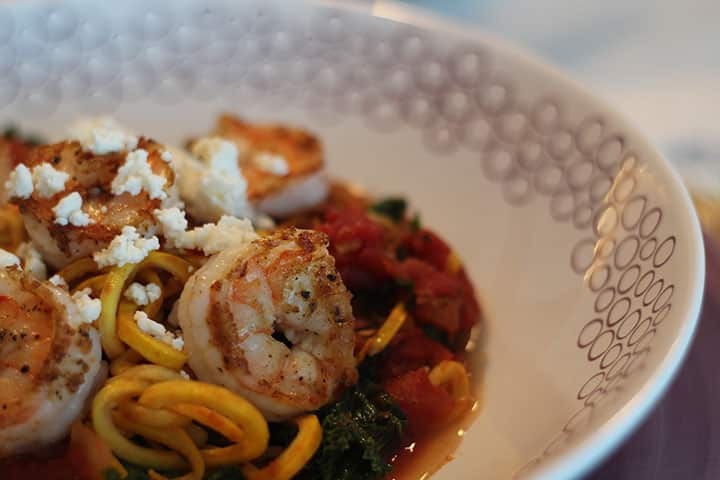 Pour the pasta mixture into your dish, and top with the shrimp and feta. I will make something similar tonight. I do not have a can of tomatoes, but I do have some fresh ones! Even better! Goodluck - post a picture on my Facebook page of what you make, I'd love to see it! Of course - thanks for stopping by! !